It has been said that a company's high-performing culture contributes to exceptional customer experiences and is at the heart of its competitive advantage. This adage rings true at Crowley. Over the past two years, the company embarked on a mission to further strengthen that culture of high performance, knowing that it will pay off in happier customers and an enthusiastic, highly skilled and engaged workforce. Accomplishing that mission involves a multitude of initiatives – from hiring the most talented people, to leveraging diversity within the organization, to providing ample training, leadership development and career-building opportunities, to enhancing benefits and recognition. "We have set a course to reinforce our core value of high performance and to build an even greater place to work," said Suz Michel, vice president, people services. "Internal employee dedication and external customer commitment is one and the same. 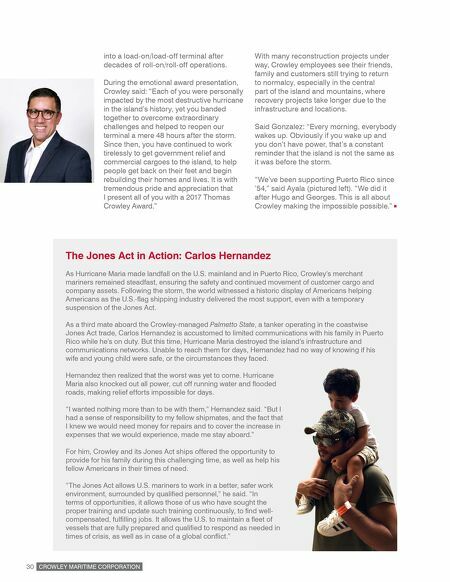 More than words, we believe that our culture of Safety, Integrity and High Performance is at the core of how we engage with our customers and grow our business." The Leading One Crowley (LOC) training module sets the foundation for a healthy, strong culture as defined by the company's core values – safety, integrity and high performance. It introduces concepts and common language to all employees facilitating collaboration and high levels of engagement and commitment. Other programs and initiatives are layered on and reinforce LOC principles. Here are a few. Employee Engagement and Professional Development Crowley's People Services team knows that employee engagement correlates directly to performance - and understanding how From recruitment to performance management, from operating vessels to interacting with customers, high performance is key to how Crowley conducts business. 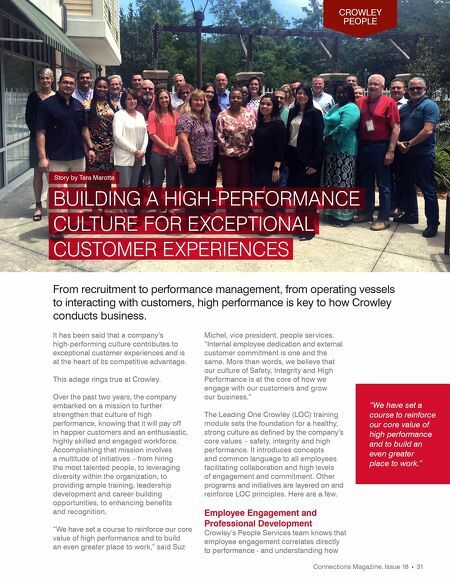 CROWLEY PEOPLE Connections Magazine, Issue 18 31 CUSTOMER EXPERIENCES CULTURE FOR EXCEPTIONAL BUILDING A HIGH-PERFORMANCE Story by Tara Marotta "We have set a course to reinforce our core value of high performance and to build an even greater place to work."